Once called the "King of Good Times" due to his extravagant lifestyle, controversial Indian tycoon Vijay Mallya has been embroiled in financial scandals since 2012. Accused of fleeing from India in 2016 after defaulting on debts of more than $1bn (£785m), a London court has now ruled he should be extradited from the UK to India where he faces fraud charges - charges he denies. The extradition ruling will be passed to the Home Secretary for approval. If he is sent home from the UK and found guilty, it will be a spectacular fall from grace for a man whose lifestyle brands have achieved global recognition and who has even spent time as a politician. Mr Mallya became chairman of conglomerate United Breweries Group in 1983 aged just 28, inheriting the job when his father died. It is best known for producing Kingfisher, India's most popular beer, but has also branched out into chemicals, paints and publishing, buying The Asian Age newspaper and Bollywood film magazine Cine Blitz. However, the businessman's more recent ventures have courted controversy. Kingfisher Airlines, launched in 2005, grew to become India's second largest domestic carrier, but racked up debts of more than $1bn (£755m) - much of which remains outstanding. It was wound down in 2012 amid reports that pilots and cabin crew had worked unpaid for 15 months. 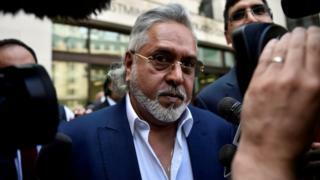 Mr Mallya was also forced to resign as chairman of United Spirits, India's biggest distiller, after its new owner Diageo accused him of financial wrongdoing. Diageo is now suing the tycoon to recover payments worth $181m. Despite the controversies Mr Mallya has maintained his trademark flamboyance and indulged his passions. He helped co-found a Formula 1 team, Force India (although it went into administration in July when his assets were frozen), and bought Indian Premier League cricket franchise Royal Challengers Bangalore for more than £70m. He was even a member of the upper house of India's parliament, elected in 2002 and then again in 2010. He quit in 2016 amid allegations of wrongdoing. Since then his creditors and regulators have been closing in. A group of Indian banks are seeking to recover more than $1bn of loans granted to his defunct Kingfisher Airlines. And India's fraud office is investigating claims he funnelled loans to the struggling airline via other firms, and hid personal assets. The businessman has denied all allegations, labelling the investigation against him as a "witch hunt".